Synopsis: Wolf von Frankenstein (Basil Rathbone) travels from America with his wife and young son to take possession of his late father's estate. He is met at the train station by the citizens of Frankenstein village, only to find that his ancestral name is hated by all who live there. Wolf, believing that his father's work was unjustly maligned by superstitious yokels, tries to convince the people that his intentions are good, but to no avail. 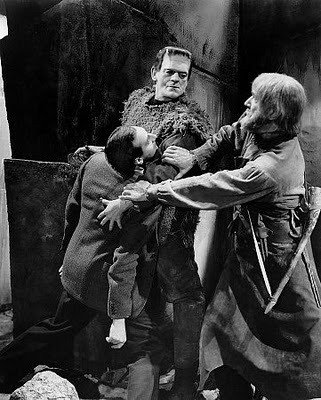 At the family estate he is visited by the local chief of police (Lionel Atwill), who warns him to lay low, since the locals are convinced that no good can come from another scientist named Frankenstein carrying out more weird experiments during raging thunderstorms. Frankenstein opines that over time the locals no doubt exaggerated the stories of his father's "monster"; but the chief politely disagrees. The stories, he says, are all true. He points out his own wooden arm, saying that when he was a boy, the rampaging monster tore his arm out by the roots. Comments: This was the third entry in Universal's Frankenstein series of films, and the last to feature Boris Karloff as the monster. It essentially plays as Young Frankenstein without the jokes. Basil Rathbone brings a haughty authority to Frankenstein that Colin Clive couldn't manage; and we get the impression that the motivating factor for Wolf is an obsession with restoring his family's good name, a somewhat healthier motivation than Henry's twisted desire for god-like power. That "Frankenstein" is now shown to be the name of the town as well as a particular family isn't a trivial detail. Wolf sees the people of the village as his people, sees his role as that of a feudal lord who must help the peasants to appreciate his father's genius. Of course, in later films various members of the Frankenstein clan would be lured into the monster-building trade for the flimsiest of excuses, but on this occasion it makes at least some kind of sense. Part of the problem in making a Frankenstein movie is that the very presence of the creature limits your story options. The monster isn't going to enroll in Oxford. He isn't going to get married. He isn't going to solve a murder that has baffled Scotland Yard. Nope, he is really only going to do one thing, and that is stumble around and smash things. The truth is, the Frankenstein films had already established their formula, and the only interest from here on out would have to be sustained by the secondary and tertiary characters. On that score, Son of Frankenstein doesn't disappoint. Lionel Atwill is classy and charming as Krogh. Bela Lugosi, never a particularly talented actor, is unexpectedly engaging here as Ygor. His frequent cackles and growls of "Frahn-ken-shtien!" are funny and memorable, and the production as a whole still carries some of the fine craftsmanship that was evident in the first two films. Son of Frankenstein was made in 1939, near the end of Universal's so-called "Golden Age" of horror films. The coming war would draw a lot of talent away from the Universal lot, and the overall quality of their output would suffer as a result. But this one was a respectable effort, a reminder of a time when studios produced workmanlike B-pictures built around solid, well-crafted scripts. You're pretty funny. I remember watching Son of Frankenstein on tv, though likely not on Horror Incorporated at the ripe old age of almost five. A Sunday matinee perhaps? Yeah, I first saw a lot of these movies on the weekend matinee programs as well. 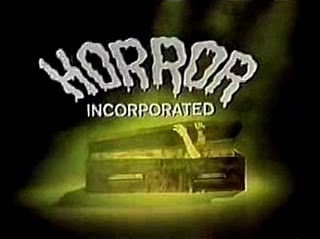 I wasn't staying up to watch Horror Incorporated until the mid-to-late 1970s. The most popular Universal franchises (Frankenstein, Dracula, the Wolf Man) really got a lot of TV play in those days, which seems rather amazing now -- even with a hundred cable channels you are unlikely to run into one. 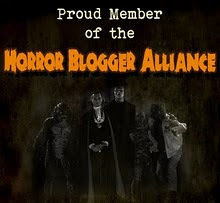 SON OF FRANKENSTEIN remains my favorite of the entire series, broadcast a sturdy 10 times in 20 years on CHILLER THEATER. Karloff's Monster is more powerful than ever, if reduced in screen time, but there's Lugosi's Ygor and Atwill's Inspector Krogh to delight audiences whenever Boris is offscreen. It never occurred to me that channel 11 would actually cut the 99 minute movie, yet my initial recording from 1984 definitely was. Today, only AMCTV, a mere shell of what it once was, still shows any of the Universals on a regular basis. TCM occasionally airs one, and the Cinemax channels have selected about a dozen over the past 3-4 years. Son of Frankenstein had an extremely long running time for a movie of that era; I'm not surprised it was cut for length by local stations. Just about all the movies we've seen so far on Horror Incorporated clocked in at less than 80 minutes. Some, like the Inner Sanctum mysteries, ran just over an hour (the same can be said of programmers like Night Monster, which were clearly meant to occupy the bottom of a double bill). What Channel 11 removed was the first scene at Castle Frankenstein; instead of Ygor ducking out of the rain when they arrive, we go from the station to Krogh's arrival in the rain., probably the best part to excise as it gets us closer to the Monster's introduction.